Plymouth is the seventh largest city in Minnesota and is a beautiful place to live! In the year 1960, Plymouth had a population of about 9,500 people. By the year 1990, the population grew to 51,000 people, which means that many homes in Plymouth were built between 1960 and 1990. 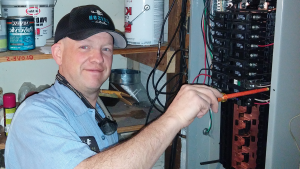 Here are three common reasons homeowners call Edison Electric when they need an electrician in Plymouth! Reason #1 – Replacing outdated light fixtures. Upgrading your light fixtures to a modern style is an easy and effective way to give your home a face-lift! Always hire a licensed electrician! Anyone can get a light to work… An Edison electrician will inspect the wiring and install your light fixture to work safely! hazards associated with Federal Pacific and Zinsco electrical panels.